Ladies and Gentlemen, we are proud to write about our current favorite beer. 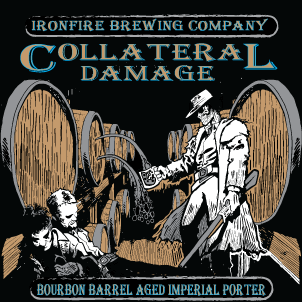 IronFire’s Collateral Damage Bourbon Barrel Aged Imperial Porter – the lengthy title matches the sheer awesomeness of this craft brew. It commands a lot of respect, as it was aged in a bourbon barrel for 12 months after it was brewed to give it outstanding flavor. I tasted it last weekend and decided to buy a few bottles. I am so glad that I did. The Porter itself is heavy, rich and dark. In case you do not know what a Porter is, it is similar to a stout but is categorically less roasty and contains more malty/smoky flavors. Get educated and learn more about the history of Beers and where beers got their name. Since this is a bourbon barrel aged Porter, it’s ABV is upwards of 10.5% ABV, which is why it is an Imperial (Imperial means more than 7.5% ABV). I would not recommend drinking this on an empty stomach, as it is quite strong. This porter smells amazing. If you like lots of malt, with a tinge of something strong lurking you are in for a treat. I smelled lots of smoky chocolate while I was agitating the beer. It is really quite pungent and will make you want your first taste even more. The flavor is overwhelming in a very good way. It is rich and flavorful, the bourbon chocolate flavor is revealed immediately. This is a complex beer which plays on many flavors simultaneously, hence the overwhelming character. The after taste is also fantastic, which can be uncommon with porters. It is so delightful though, you will hardly notice the ABV kicking in by the end of the glass. Over all, I was very impressed with this BBA Porter. The experience was fantastic and left me not only smiling because my mouth was left with amazing flavor, but it is strong too so you are sure to be a little buzzed after a full pint. 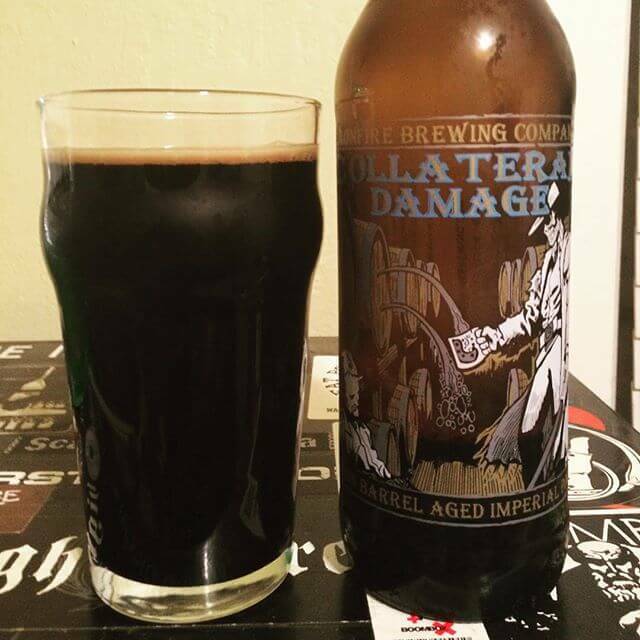 After doing a little research, I found out that it was the 2015 Battle of the Brews Winner. Makes sense.